(February 9, 2004) -- Ralph Waldo Emerson once said, a "foolish consistency is the hobgoblin of little minds." If so, some LB officials must have very large minds indeed. We conclude this after a February 7 spectacle that taxpayers citywide will almost certainly see repeated on City Hall's cable TV channel in the weeks prior to the coming City Council elections. 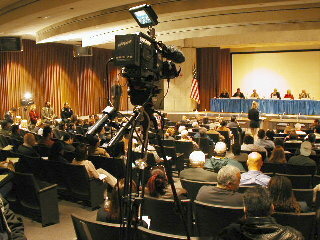 Legally, it was a joint meeting of the City Council's Public Safety Committee and Housing and Neighborhoods Committee...but this one included three television cameras, high intensity TV lights, city employees running around with wireless intercoms, plus City Hall appointees and management in the main LB library's auditorium to help stage a self-proclaimed "gang summit." The chair of the Council's Public Safety Committee, 4th district Councilman Dennis Carroll, served as ringmaster for the event. The chair of the Council's Housing and Neighborhoods Committee, 5th district Councilwoman Jackie Kell mainly watched, alongside Councilmembers Bonnie Lowenthal and Val Lerch. Yes, in December 2003 Councilman Carroll indicated he planned to hold a "graffiti summit." Yes, we presume it morphed into the "gang summit." Yes, we find summitry on such subjects mainly well-intended but in the wrong venue. Some speakers attributed LB's gang problem to bad music. Others blamed bad parenting. The best line came from Karen Hilburn, Director of Student Services for the LB Unified School District. "Truancy is the kindergarten of crime," she said. We strongly agree with Ms. Hilburn. And we don't disagree with others who note the complexity of the gang problem. But LB Councilmembers don't run the LB schools. And LB Councilmembers don't run the music industry. What LB Councilmembers really do decide is how many police and firefighters the city has. They do this when they vote on how taxpayers' money is spent. That's their job, their first responsibility. Well-governed cities provide sufficient police and firefighters as well as libraries. Lots of cities do...and they don't have a Port to subsidize their operations. We hope the TV cameras show the parade of LB officials who lined up to suggest in various formulations that LB's gang problem really isn't about "suppression" (our translation: having enough police to do the job.) What a sight. "WHEREAS, there is no equivalent for more officers on the streets engaging with the community to both provide local intelligence and continue the ongoing fight against crime, and the COPS [federal taxpayer funds for police] hiring programs are critical to this effort." Sorry, but LB Councilmembers can't have it both ways: supporting more police to get federal taxpayer money while simultaneously portraying police as barely relevant to LB's major crime problem. We consider this civic hypocrisy, pure and simple. 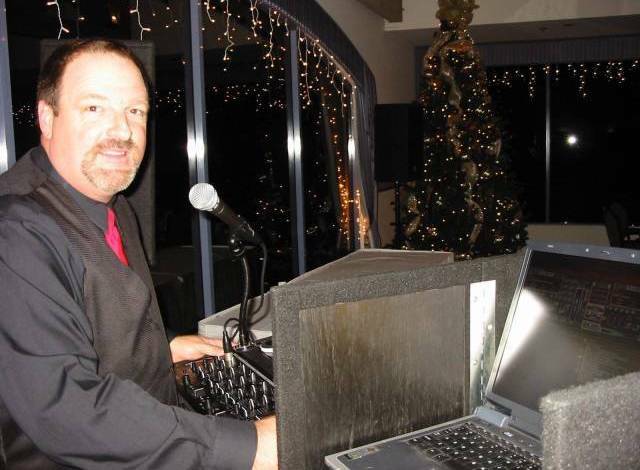 Making matters worse in our view is the failure of the Council's Public Safety Committee -- which Carroll has chaired since July 2002 -- to take up a report on LB's police level, publicly referred to the Committee by a March 2002 voted action of the City Council supported by Carroll himself. 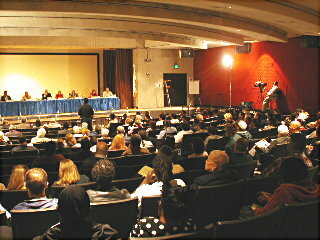 On March 19, 2002, on motion by now-Vice Mayor Frank Colonna (seconded by Councilwoman Lowenthal), the Council referred a City Auditor's analysis of LBPD police staffing -- the number of police officers actually provided for LB taxpayers -- to the Council's Public Safety Committee for an in-depth review on topics including the reserve program, how resources are deployed, definition of terms, and overtime use. Councilman Carroll piped up in agreement: "I have heard from the people that are supposed to know, and that's the Chief and the City Manager and the City Auditor that the big picture is going to require some in depth analysis and recommendations, and I think Councilman Colonna's suggestion is a good one..."
Colonna's substitute motion sending it to the committee carried 7-2 (Yes: Lowenthal, Baker, Colonna, Carroll, Kell, Richardson, Shultz; No: Grabinski, Webb). A few months later in July 2002, Mayor Beverly O'Neill named Councilman Carroll to chair the Public Safety Committee. That meant Carroll could have delivered what he publicly voted for and the Council explicitly directed. He didn't. No, the police staffing report isn't "bottled up" in Carroll's committee; the Council could deal with it itself anytime it chooses. And the Public Safety Committee doesn't set police levels; only the full City Council does that. However, as we opined last month, even viewed in that generous light, from our perspective Councilman Carroll's conduct has been just awful on this. In March 2002, then-Councilman (now Vice Mayor) Colonna accurately said that LB's then (now former) police chief hadn't come to the Council and said LB needed more police officers. But in September 2003, LB's current Police Chief did say that. Even with these facts thrown in his face by the Chief of Police, Public Safety Committee chair Carroll still didn't act on the police staffing report. Yes, Chief Batts stopped short of actually asking for the cops. As management (he said a member of the "city team"), Chief Batts noted that the Council faces budget challenges and needs to strike a balance on allocating resources. "[W]e are fully aware we as a city are not in the position to expand the Department at the needed rate," Chief Batts said, later adding, "We have staffing shortages, and when the resources are available, we need more police officers." Meanwhile, the Council budgets barely two sworn officers per thousand residents...and the neighborhood level is even thinner after subtracting roughly two dozen budgeted cops detailed to port and airport security, plus five or so to LBCC. On October 19, 2003 in the 1200 block of East 7th St. -- roughly a mile and a half from where Chief Batts delivered his prescient budget presentation -- 22 year old Sok Khak Ung, a U.S. Marine on active duty who survived combat in Iraq, was shot in the head and twice in the torso and died in a LB hospital. Ung was stationed at Camp Pendleton and was visiting his family members in LB. Another young man was killed with him. Other killings followed. Then came pesky national news coverage. Then came Carroll's "gang summit." And in April 2004 comes the election. We have been consistent on police staffing regardless of elections...even when we were a voice in the wilderness. We have never expected to have a police officer on every block, but we do expect elected officials to follow through on their publicly voted actions...and we support removing them when they don't. We again urge Councilmembers to bring a motion directing Public Safety Committee chair Carroll to bring the Council within 30 days the overdue analysis of police staffing for which Councilmembers Carroll, Lowenthal, Baker, Colonna, Kell and Richardson voted nearly two years ago. We continue to watch in amazement as 4th district challenger Patrick O'Donnell seems to shirk opportunities to confront incumbent Carroll on his record. O'Donnell didn't legally challenge assertions we'd classify as whoppers in Councilman Carroll's candidate ballot statement, now on its way to the printer. He didn't publicly challenge Carroll at the "gang summit" -- a lawfully convened Council committee hearing -- over Carroll's failure to take up the police staffing report fermenting in that very committee. If Mr. O'Donnell thinks such things don't matter, he shouldn't be too upset by what we've just written. We say, damn the torpedoes. We ask again: Councilman (and Public Safety Committee chair) Carroll, where is that report?